Our children love to learn history throughout the curriculum and we make sure we do this in a variety of fun and exciting ways. Often our half termly themes have a history focus meaning the children get to experience a range of historical workshops and exciting school trips as part of their launch pad! Throughout the school children learn and use a range of historical skills to discover more about history around the world as well as the local history. Our teachers ensure that our history curriculum is of a high academic standard and has a range of cultural themes. 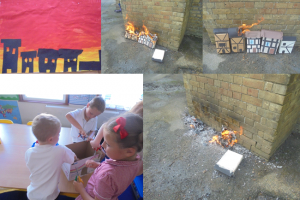 The staff and children at Hawkinge Primary School believe history is an important part of our school and we aim to make it as awe inspiring and ‘real life’ as possible. This terms pupil voice was based on History, the Pupil Voice leaders asked the pupils questions about history, some of the questions involved things like: What have you learnt about in History so far & what would you like to learn more about in history .Then they were asked to vote for one question which was Does Green Pen help you improve your understanding of the lesson? History is about learning about the past, famous people, special events and special places. This year children have learnt about; the Egyptians, Victorians, WW1, the Stone Age, Titanic, the Taj Mahal, local history and about how everyday life has changed over time.